Are you ready to fall in love?? 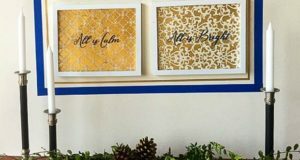 We’re setting the mood for a Valentine’s Day celebration with a stenciled wall art project that you can adore all year long. 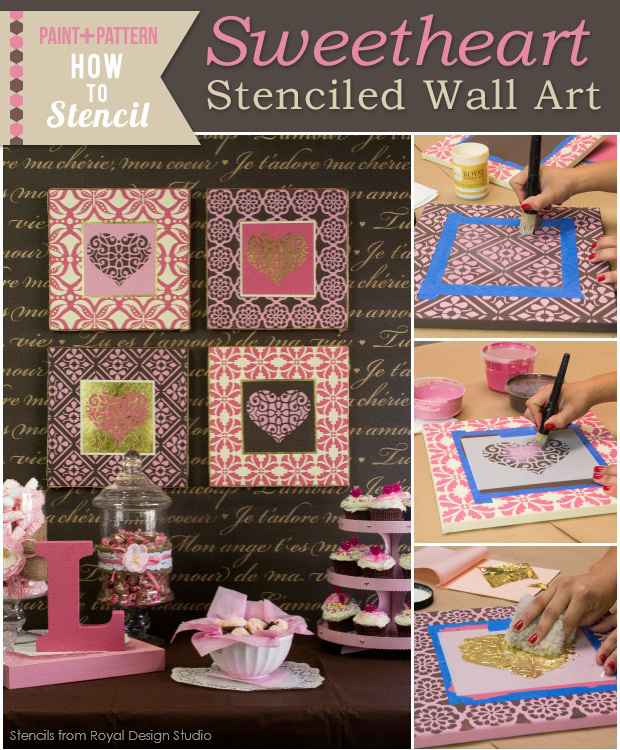 Pretty shades of pink, brown and metallic gold come together with sweet stencil patterns, including the Royal Design Studio FREE stencil of the month for January 2015, the Lace Heart Stencil. 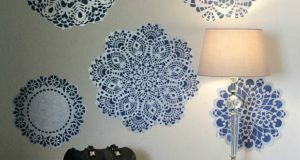 You can easily adapt this stenciled wall art project idea to paint colors and stencil patterns you might already have on hand. Let’s paint! Stencils From Royal Design Studio: Small Butterfly Kisses, Small Margarita Lace, Small Adana Abstract, Small Anisa Embroidery . Clear Royal Stencil Size by Royal Design Studio. Chalk Paint® Decorative Paint Colors: Primer Red, Cream, Old White, Antoinette, Emperor’s Silk, Olive, and Graphite. 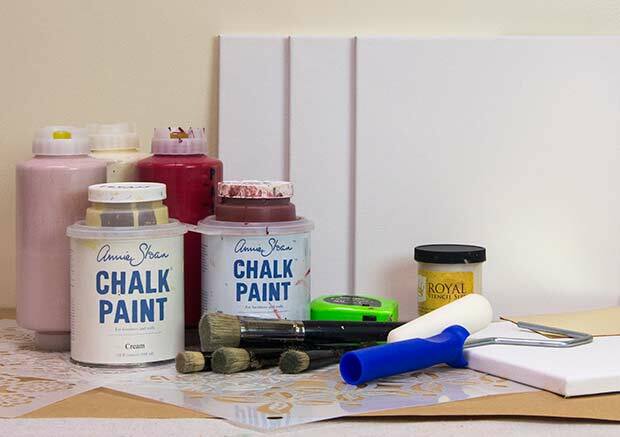 Step 1: First paint each one of your canvases with the Chalk Paint® color mixes using a foam brush or roller. For a better coverage apply two coats of each color, Allow Paint to dry Between Coats. Stencil the Custom Soft Pink canvas with Margarita Lace Stencil and Custom Brown. 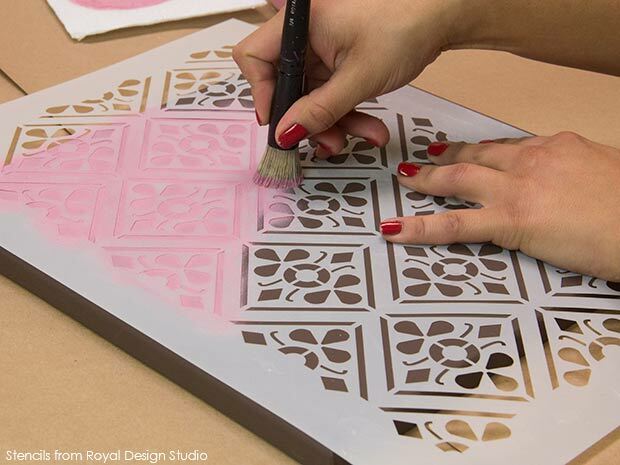 Stencil the Cream canvas with the Small Adana Furniture Stencil and Custom Pink. 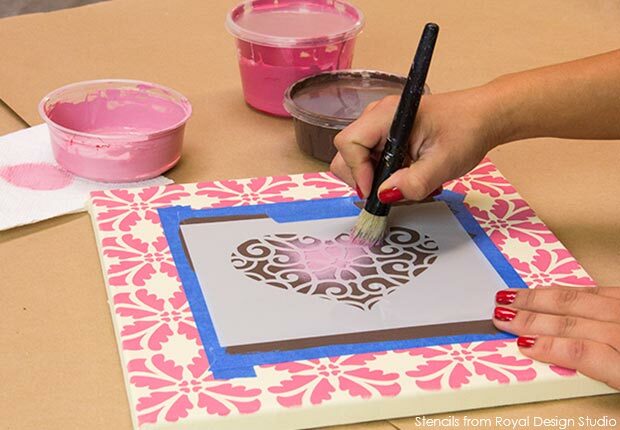 Stencil the Custom Pink canvas with the Small Butterfly Kisses Furniture Stencil and Cream Chalk Paint®. Stencil the Custom Brown Canvas using the Small Anisa Embroidery Stencil and Soft Pink. Step 3: Use a measuring tape or a ruler to measure and mark off a 6 ½” square on the center of each canvas. Use Blue Painter’s Tape to mask off this section and paint with a foam brush. 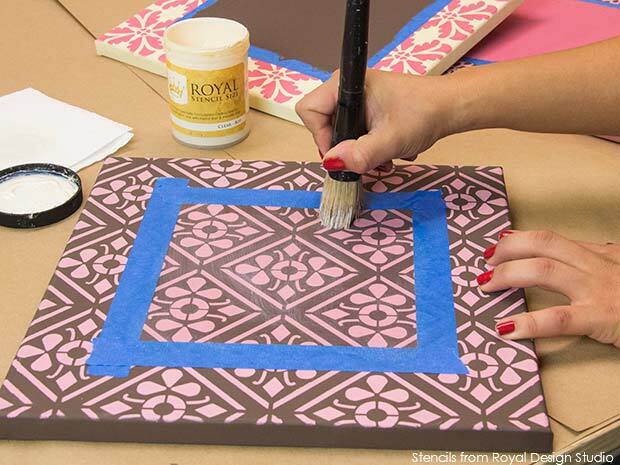 Use the Brown Chalk Paint® Color on the Cream and Pink stenciled canvas. 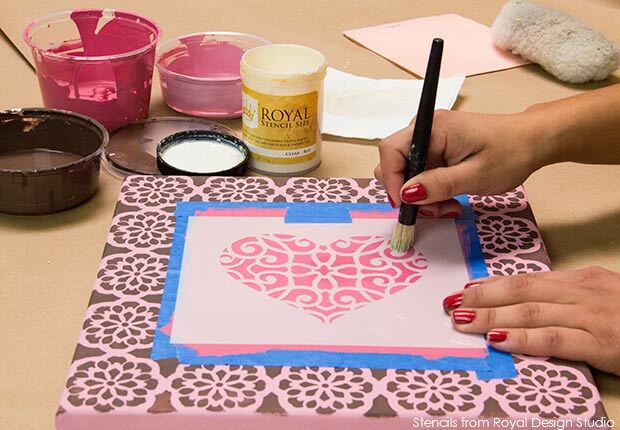 Use The Soft Pink Color on the Pink and Cream stenciled canvas. For the Soft Pink and Brown stencil canvas use the Pink Chalk Paint® color combination. 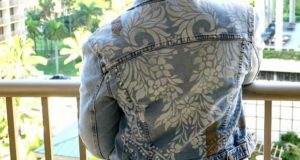 First apply a coat of Clear Stencil Size with a small paint brush, let it sit for approx. 10 minutes. Apply a second coat. Let this second coat dry for another 10 to 15 min. or until it becomes tacky. 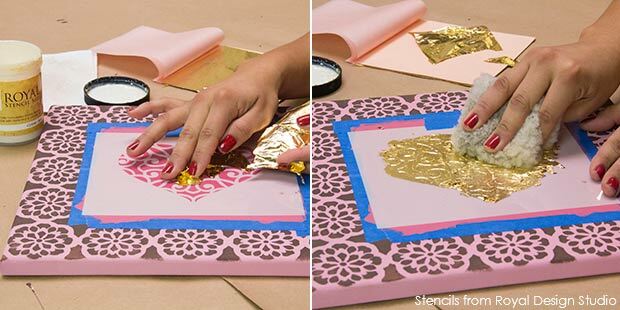 Apply a layer of gold leaf to the area with the size. Finally, use a soft rag or lambswool to lightly burnish the gold leaf into the size and remove any loose flakes. 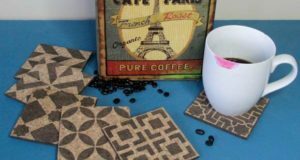 Use the Custom Soft Pink color to stencil on top of the Custom Brown Square. Stencil with Custom Brown on top of the Custom Soft Pink square. 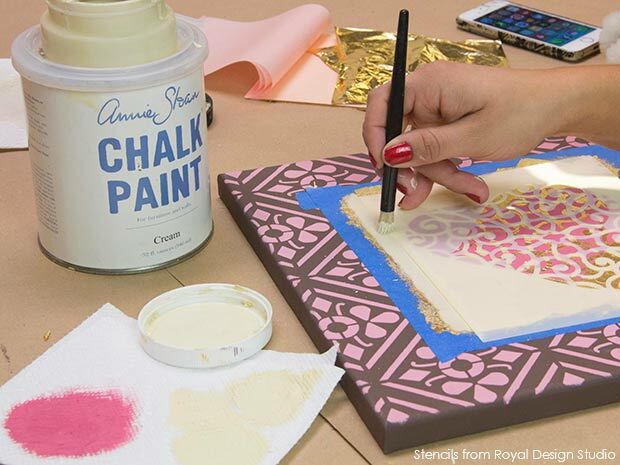 Use the Pink Chalk Paint® to stencil on top of the gilded square. Apply a thin layer of Stencil Size with a ½” Stencil brush. Let it sit for about 10 minutes before applying a second coat. Let the second coat dry for about 10 minutes or until it becomes tacky. 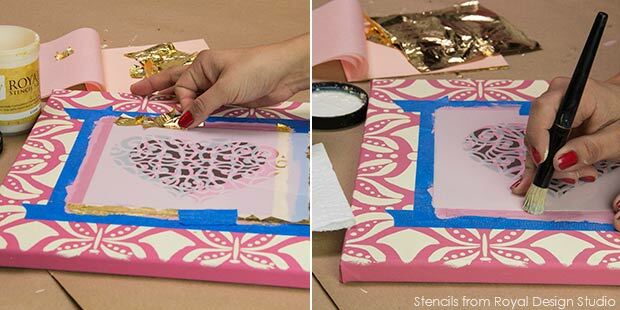 Apply a layer of gold leaf with your fingers through the pattern. Use a soft rag or lambswool to burnish the leaf in to the size and remove any excess. Step 5: Using the tape surrounding each square and the edge of your stencil, stencil a 1/8” pin stripe on the inside edge of each square using a small Stencil Brush. 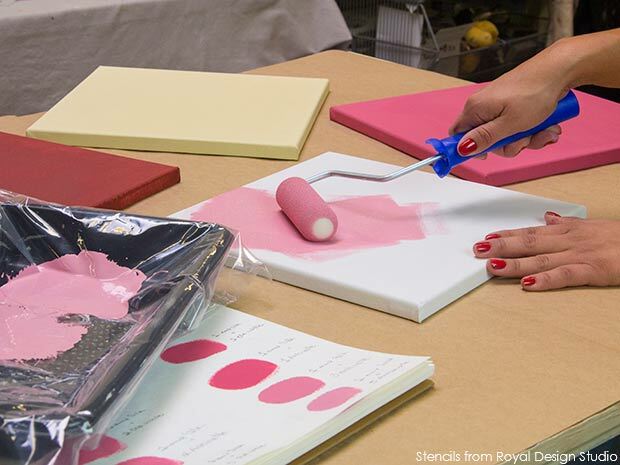 Use Cream Chalk Paint® to paint the pin stripe on the canvases stenciled with brown and soft pink. For the two canvases stenciled with Cream and Pink Chalk Paint® apply two coats of Clear Stencil Size with a small Stencil Brush. Allow a drying time of 10 to 15 min. between coats. When the second coat becomes tacky, apply a layer of Gold Leaf. Use a soft rag or lambswool to burnish the leaf and remove any loose flakes. We finished our canvases off with a pretty gold ribbon to coordinate with the gold leaf. 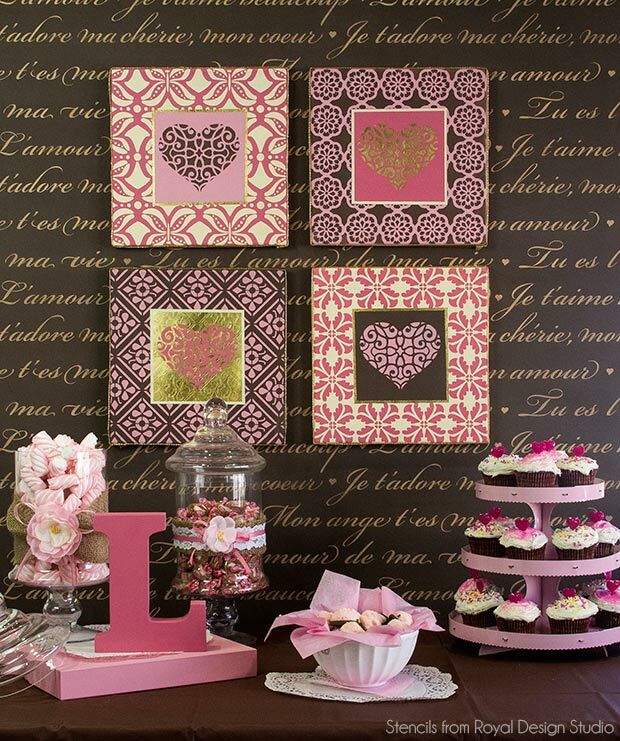 Together these sweet canvases make a great grouping of stenciled wall art that’s the perfect addition to your Valentine’s Day party decor. They would also be simply adorable in a sweet little girl’s room or nursery, hanging above a desk, or anywhere you want to show a little love!! We’d love for you to show a little love for this project too! Please feel free to pin to Pinterest and share on Facebook! So pretty! Great idea. And you had a cupcake party?! You really make it seem really easy with your presentation but I to find this topic to be actually one thing whichI think I might by no means understand. It seems too complicated and extremelywide for me. I’m looking ahead for your next put up, I will try to getthe hang of it!